This is the time to try some Spark Sudoku. I present you two puzzles(Rules of Spark Sudoku). Do not forget to use number from 1 to 8. As I told you, this is the only place on the web that you can find these puzzles. 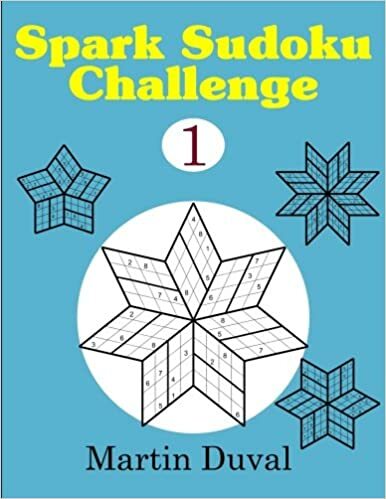 If you like Spark Sudoku why not buying my book Spark Sudoku Challenge ? You will be happier and everyone will envy you. 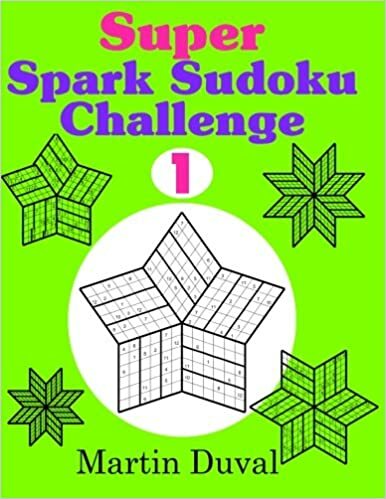 You could also try a more complex version the Super Spark Sudoku in my book Super Spark Sudoku Challenge. This variant is a little bit larger so you need to use numbers from 1 to 12. I am going to publish new Super Spark puzzles soon (right now you could try the old ones - look in menu). Why not doing some Jigsaw Sudoku puzzles ?. I present you two variation of this puzzle 1) with an usal 9x9 size and 2) with a 16x16 size a Super Jigsaw Sudoku Puzzle ! 2) And the Super 16x16. The Killer Sudoku is always a challenging puzzle, it has no given only cages (the dotted box) that gives the sum of all numbers inside. But this is enough to solve this puzzle but also we need patience and cleverness. It has been a long time since Kakuro appeared in these pages. In order to remedy to this anomaly I present you three puzzles. Have a nice time !!!. This is three Thermometer puzzles (Rules of Thermometers) all of them have the same size : 9X9. Enjoy !! If you want more of this puzzle, you could buy Thermometer Puzzle Challenge 1. with 110 puzzles of different sizes and levels of difficulty. Update of the book section.